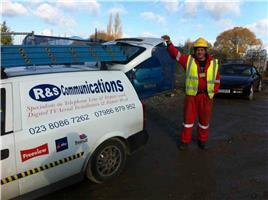 R & S Communications - Telecommunications, TV Aerials/Satellite Services based in Marchwood, Hampshire. Invoice history based on 565 reviews. Hi my name is Paul, founder of R&S Communications since March 2008. We install & repair TV aerials/sat dishes and all types of telephone repair and installation work. It has been our aim to keep our customers extremely happy this we achieve by very reasonably priced work at the very highest standards of workmanship & customer care at all times. My company now provides telephone installations /repairs TV Aerial/sat dish cat 5 & data cabling work, to small business & residential customers. We offer all our customers a general purpose handyman MNTC work, program, window cleaning; guttering repair and cleaning; and many more general house hold works. We have skills that have been acquired throughout our many years of working and have the knowledge that has benefited previous customers and helped to create a good business through reputation and previously satisfied customers. So please call at no obligation, to find out more of our services and how they may help you. We also provide TV wall mounting subject to survey. We do not charge by the hour, our quotes include call out and survey depending on property size and customer requirements as this may alter up or down due to work type & customer agreement. Once a price is agreed it is honoured to customer satisfaction, with the promise of customer after care on all work carried out if ever required. For our business customers we are able to accept 2 forms of payment: cash and BACS transfer – for BACS transfer we do request that the payment reaches our account before the work begins. For our residential customers we do require payment by cash only. Free estimates to people living in the Marchwood area. Please be aware that we do charge for diagnostic tests, if needed, before work is carried out. Gary - Engineer, Fully Qualified and time served 25 years.